Monoreach in Khmer, from which the hotel’s name was derived, means the mind of the country ruler, the king, and his compassion to his land and people. This has been the legendary expression of the famous King Jayavarman VII who has brought prominence the grandeur of the Khmer Empire during his time, hence, at Monoreach Angkor Hotel. We think and treat our guests with much care, comfort and hospitality Monoreach Angkor Hotel is a sanctuary for guests who expect excellent traditional Khmer hospitality and service. Whether business or leisure, Monoreach is your luxurious home away from home. Elegantly furnished to provide a comfortable stay when you return from the magnificent temples of Angkor, our professional and friendly staff will ensure that your stay is luxurious, comfortable and relaxing. 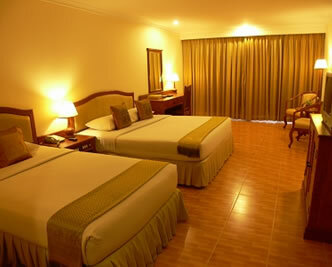 It had 110 spacious and well-furnished rooms and complete with facilities and amenities of international standard . It is so conveniently located on National Road No. 6 just 8 minutes drive from Siem Reap International Airport and about 10 minutes to the world famous Angkor Wat temples. Monoreach Angkor Hotel in larger map.